An extraordinary antique french master violin made & signed by Georges Apparut, 1943. Extraordinary antique violin made by the french master Georges Apparut (Juvaincourt 1877 / Mirecourt 1948) in the year 1943. Georges Apparut was trained by Paul Blanchard in Lyon and Georges Mougenot in Bruxelles. This instrument, made 5 years before his death, shows how this master was at the summit of his art at the time. The woods employed are extraordinary, a top made of two pieces of spruce of the highest quality showing regular thin grain lines, a back made of two parts of wonderfully flamed maple, the ribs, neck and head of the same wood. The purfling is made with a fantastic regularity, a work that only masters can achieve. The button, the f holes, the edges are also masterly executed, in the pure french tradition but still with a particular style. The head has the strongest character and is fabulously carved. The oil varnish, of a rich texture and of a red-orange colour on a golden ground, is playing with the light, a real pleasure to the eyes. Of course, everything is original in this instrument, up to the soundpost fitted by the master, the chinrest and the fine rosewood pegs! We found it in such an untouched condition, that we just had to fit a new bridge, change the tailpiece for a rosewood one, and put a new set of Thomastik Dominant strings : that was. ItThe violin itself is in a mint condition to the exception of a little surface crack between g and d peg holes, stable and not going through. A real beauty, entirely preserved! On the inside back can be found the original label, signed by Georges Apparut. 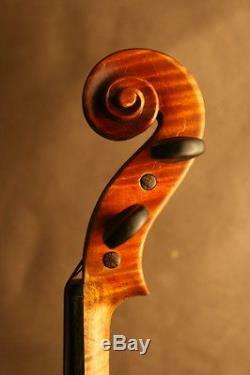 A little above, near the center joint of the back, the master double-dated the instrument "1943". And at the upper inside back, he signed the violin again "Georges Apparut 1943". Unfortunately, this last signature cannot be pictured due to its place, but it's there. (label pictures to be uploaded later). The instrument comes with a new BAM case. The item "FINE OLD ANTIQUE FRENCH MASTER VIOLIN MADE & SIGNED BY GEORGES APPARUT, 1943" is in sale since Saturday, March 4, 2017. This item is in the category "Musical Instruments & Gear\String\Orchestral\Violins". The seller is "ames-anciennes" and is located in Toulouse. This item can be shipped worldwide.